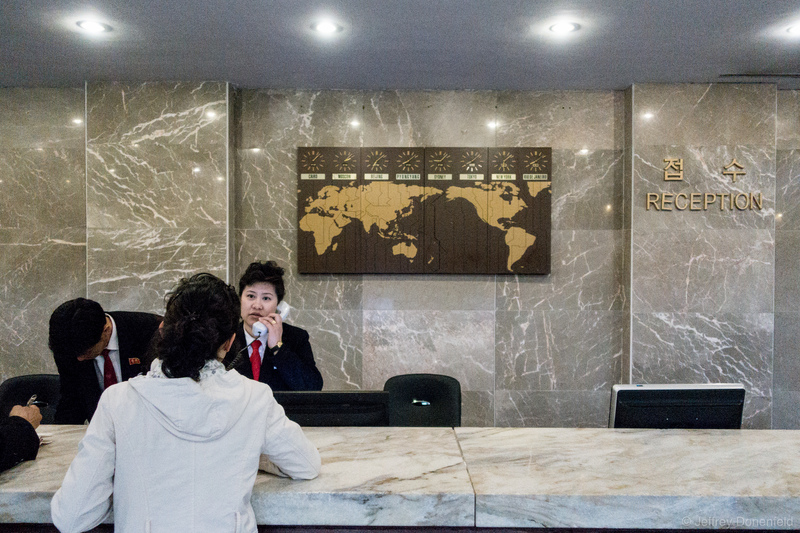 Checking in at the Yanggakdo International Hotel. This hotel in the heart of Pyongyang is massive, and features a rotating restaurant on the top floor. My group arrived the night before the marathon, along with a number of other marathon groups. Everybody seemed to check in at the same time, and because of this, the elevators were severely overloaded. With so many guests, the elevators were not large enough or fast enough for everybody - especially since only a few of them were working. The checkin desk was very basic. There were computers at the desk, bu tI never really saw any of them being used. Checking in at the Yanggakdo International Hotel. This hotel in the heart of Pyongyang is massive, and features a rotating restaurant on the top floor. My group arrived the night before the marathon, along with a number of other marathon groups. Everybody seemed to check in at the same time, and because of this, the elevators were severely overloaded. With so many guests, the elevators were not large enough or fast enough for everybody – especially since only a few of them were working. The checkin desk was very basic. There were computers at the desk, bu tI never really saw any of them being used.